Right now, big cats are disappearing from our planet at an alarming rate. We to have decide now if we want to talk about lions, tigers, leopards, cougars, jaguars and cheetahs in the future in way we talk about Dinosaurs now. As a National Geographic Kids Insider, I recently had the opportunity to speak to Wildlife Biologist, Luke Dollar, to learn more about the National Geographic Big Cats initiative and how they’re trying to change the dire situation facing big cats. Dollar, who has over 20 years of conservation experience, says the organization evaluates the problem in each environment where big cats live and then implements a solution that is necessary to stem the loss of big cats. The most important thing is to find real solutions that really work in the areas where big cats are threatened. The biggest step to helping big cat populations from diminishing is to teach communities with big cats how to coexist with the these wild animals. It’s important for their conservation that the initiative to be locally driven. The people in this area need to be given real solutions that are easy to implement. For example, herders in Kenya and Tanzania are concerned about protecting their livelihood which is dependent upon their livestock. 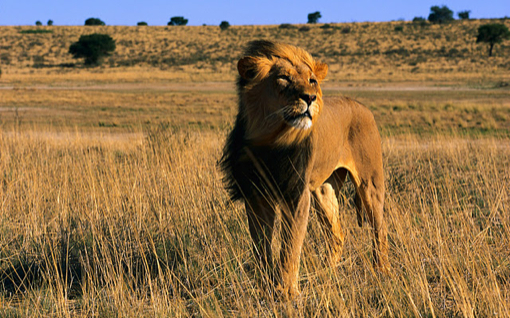 Lions like to hunt at night and if the livestock are left to graze it makes them vulnerable to attacks. 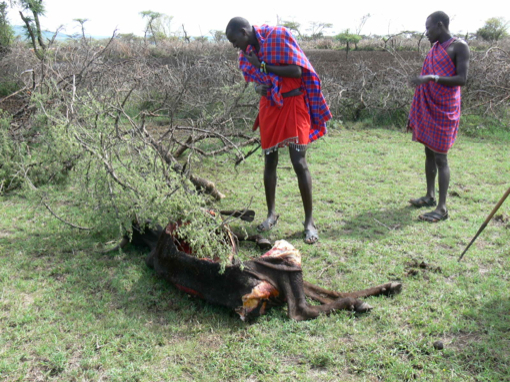 One solution to this problem is to enclose the livestock in a predator proof Boma which is like a crowell or enclosure. A Boma is cheap and effective at keeping lions away from the livestock which makes herders feel less threatened by lions in the area. The mortality rate of lions in the areas where Bomas were implemented dropped by 2/3 in just the first year they were built. Are you ready? Because it’s time to cause an Uproar! The Build a Boma Campaign is striving to stop the dramatic decline in big cat populations. In Africa, the lion population has dropped 90% during the last 75 years. Once numbering in the hundreds of thousands, there now may be as few as 30,000 of these amazing animals and their numbers are shrinking every day. A Boma costs only $500 to build and improve and $25 a year to maintain. Good bomas are proven to decrease the killing of lions. Help support this project by making a donation or creating a fundraising page today. If you can’t contribute right now, share the page on Facebook and Twitter. All donations—100%—will go toward building better bomas to protect lions, livestock, and livelihoods. Beginning Friday, Nov. 29, 2013, at 9 pm ET/PT, Nat Geo WILD presents the FOURTH ANNUAL BIG CAT WEEK, the network’s most-watched week for the past three years, to dramatically showcase the world’s most extraordinary big cat species. More than a television event, Big Cat Week is an extension of the Big Cats Initiative. These shows help build awareness about the declining big cat populations around the world. When people are more aware they want to participate in conservation which builds the global impact. Kicking off this year’s week with Nat Geo WILD is Man v. Cheetah with Tennessee Titans’ Chris Johnson — the NFL’s fastest running back — and Chicago Bears’ Devin Hester — the super-agile wide receiver and kick returner — both taking part in an extraordinary challenge to literally go one-on-one in a first-ever race with a cheetah at Busch Gardens Tampa’s Cheetah Run attraction. Check out National Geo WILD for more shows.